From left are Clinton County Solid Waste District Coordinator Jeff Walls as well as Darrell Petrey whose business is called We Help Others. WILMINGTON — With an endorsement from the Clinton County Solid Waste District, a local man who has a second-hand resell business and an innovative fundraising process was authorized Monday by the county commissioners to apply for a 2019 Market Development Grant from the state. Darrell Petrey’s company is called We Help Others, and on the fundraising front it collects, for example, gently used or new household items from local residents and resells them to benefit local schools. He will apply for a $51,000 grant from the Ohio Environmental Protection Agency (EPA), $25,500 of which would be a local 50/50 match from Petrey or his organization. The grant funds would go toward a box truck, a forklift, storage container, a dump trailer, plus branding and informational items. Why might the EPA want to support his operations? For one thing, his business reduces waste by rescuing lost value, as Petrey puts it. As a company, they want to aggressively pursue marketable unused items and recyclables in the community, he added. Previously, TimberTech in Wilmington was awarded a Market Development Grant, said Clinton County Solid Waste District Coordinator Jeff D. Walls. Walls was joined by Petrey at an appointment with the commissioners. In the school fundraising aspect of the business, they currently are focusing on Clinton-Massie Local Schools. In partnership with the Caesar Creek Flea Market, We Help Others has announced a new retail space to raise funds for local schools and their students. It’s called Your Community Store and is located at the flea market near the I-71 and U.S. 73 interchange in Clinton County. A donation center also is set up there. This retail location is in addition to an online selling process operated out of a warehouse, said Petrey. Commissioners voted 3-0 to authorize the grant application, with the Clinton County Solid Waste District office to be the required governmental agency that serves as a “pass-through agency” to document and receive any funds that are awarded. 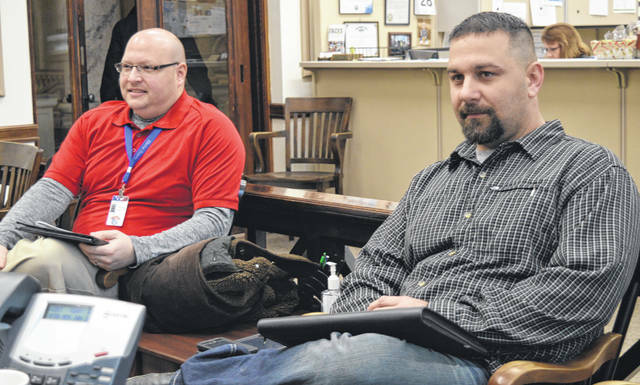 Commissioner Kerry R. Steed said he has first-hand knowledge of how Petrey’s business works and likes the idea of helping schools and others, while Commissioner Mike McCarty said he likes the business model and thinks it has a lot of potential. • Starting in 2020, commissioners will no longer fund the CodeRED alert system that’s used to send emergency notifications to county residents’ cell phones and land lines, or by text and email. The Clinton County Emergency Management Agency (EMA) and the Local Emergency Planning Commission are the other two entities that split up the annual $23,950 cost for CodeRED. The EMA will decide later this year whether to pick up the commissioners amount and continue the service. Clinton County Commissioners President Brenda K. Woods said the two reasons for the commissioners deciding not to pay toward CodeRED beginning next calendar year are the small percentage of Clinton Countians who have signed up for CodeRED, and the availability now of “so many [alert notification] apps out there available for free” to people. “We’re thinking people have taken advantage of those [apps],” said Woods. There is no fee for the CodeRED alert system to Clinton County residents.